On Wednesday is the first official day of the PGA Merchandise Show. One has to go to the Orange County Convention Center to appreciate how enormous it is. It’s the largest convention center in the world and as enormous as the PGA Merchandise Show is, it may only take up about 1/8th of the entire convention center. OCCC actually expands across International Drive and the enormity of it (did I mention it’s enormous?) is something to behold. What I do is I go to the PGAShow.com Web site before the show and go thru the list of all of the exhibitors. I then look at the ones that I’m not familiar with and I check to see what they are about. If it’s something that I may be interested in I click on them to my ‘favorites.’ They web site used to compile them all together for you in either alphabetical order or by the order of their booth number. The site no longer does that for some reason, so I had to create a spreadsheet in Google Sheets and then I just carried my phone with me and went to the booths I wanted to go to. You really don’t need to list the large OEM booths in your ‘favorites’ because you will spot them. Places like Titleist, TaylorMade, Callaway, Ping, etc. are really something incredible for an exhibit booth. Travis Matheiu’s booth had a pool table, DJ and was giving away free beer. But the reason why the favorites list is important is that it’s easy to forget about those lesser known companies that really have something great to offer. This is how I found MySwing Golf and Ikkos over the years. Let’s get this out of the way…this was a very good, solid PGA Show. I don’t think it quite lives up to the 2011 show, but I wouldn’t argue too much against that. You had so much new stuff that had yet to be released where in years past stuff had been released months before the show. I really think OEM’s and tech companies need to be cognizant of that because by releasing it before the show you really kill off the hype and interest in the product. I think this helps better justify Trackman’s pricing which is in the $25k range while competitors are closer to the $10-$12K range as Trackman has more functionality now with a robust system that can provide full swing, short game and putting data along with impact location. The major advantage in terms of functionality that I see from Trackman’s competitors at this point would be FlightScope’s acceleration profile which is a great product for shaft fitting. The focus with radar/sensor systems seems to be trending towards putting. And while there were some interesting products, SAM Puttlab is still the top machine out there in my opinion. Their latest edition provides so many countless upgrades and can replay overhead views of the putting stroke. That’s where I saw longtime friend and fellow 315 refugee, David Orr (www.flatstickacademy.com) doing a presentation. David was doing the SAM Puttlab presentation on a putting surface, that I assume was a PuttView surface. They can alter the slope of the putt and in David’s presentation they changed it to flat to 2% breaking right to left in about 10-15 seconds. What I found interesting was that I could not notice the slope change and that’s why it’s so important to feel the break using your feet instead of your eyes. And I think that’s one of the issues I have with reading putts…I will read them with my feet, but the peripheral vision can greatly misinterpret the slope. The MISIG is a bit of an exercise and swing training tool in one. For the better players I think it’s more designed for exercise. I was going to buy one, but it was one of the first booths I visited and they had a great PGA Show price of $60 (normally it’s $90). I didn’t want to carry it around and when I got done with the Show I forgot to go back there and purchase one. The benefits I see for it is that I have problems with my right scapula and it often leads to elbow issues and when I tried the MISIG, it really started to loosen up that scapula. I also think that using it for your non-dominant side is a helpful stretch as well. It comes with 3 different bands to provide different amounts of resistance. It should be noted that the big thing MySwing has integrated is a force plate system so not only can you get the body motion data, but the pressure data as well. Also by the SAM Puttlab was my good friend Scott Fawcett (www.playinglesson.com) and his DECADE golf data. He’s now certifying instructors which is a great thing to see. We discussed how my findings in 2017 Pro Golf Synopsis were in line with what he has researched as well. But Scott’s work is so advanced in terms of visuals and understanding of what really goes into an effective golf strategy. Everybody in golf likes to use the old say ‘everybody has a plan until they get punched in the face’, but failing to plan is really planning to fail. And you can plan for when you take that right cross to the chin just like you can plan when you pipe a 300 yard drive down the middle of the fairway. I’m glad to see that Scott is getting his work out there because you would be amazed at how even Tour players get talked out of strategy that is really common sense over time of playing competitively. Things like not understanding that if you’re 70 yards closer to the hole…you’re generally far better off than having your ‘money yardage’ into green. And if you’re not…then you simply need to work on your short game because you’re leaving strokes out there. But, I feel that proper strategy off the tee and on par-5’s is normally more offensive minded than defensive minded. And I think with so many players being way too conservative off the tee they are not letting their talent shine and they are not allowing themselves…to be themselves. It causes frustration to grow and can make playing the game very bland. So anybody that really knows the mathematical strategy to the game and can convey that to golfers I’m fully on board with. One of my favorite booths that I was looking forward to was the GolfMechanix booth. They didn’t due to the size of the machine. But I was told it measures the 3 dimensions of the Center of Gravity with relation to the longitudinal (height), latitudinal (east-west) and how far forward or backward in the head the CoG is located. 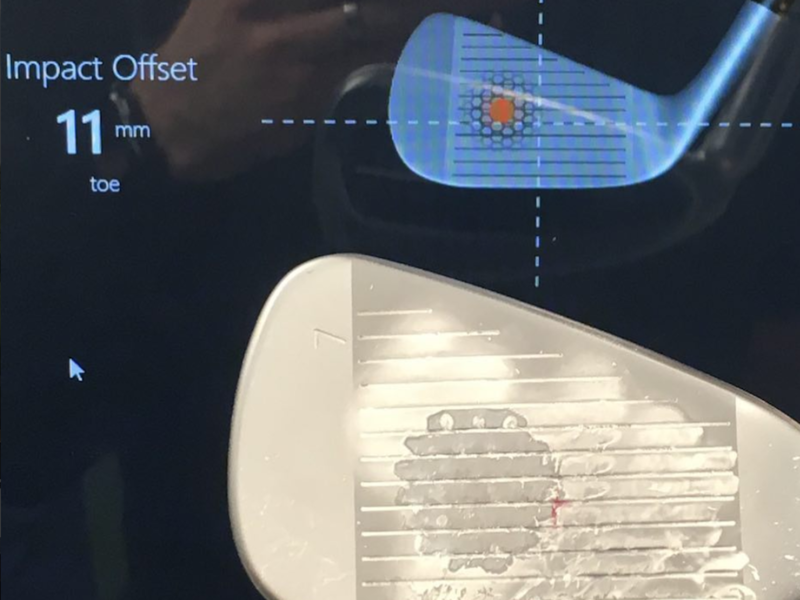 I think this is what real product reviews and testing are missing…giving facts and details about clubs and determining how those properties will affect the ball flight instead of basing everything on the looks and how the reviewer happens to be swinging the club that day. That retails for $730 and I think it’s a great product for a fitter that can afford to get plenty of shafts and then test them and find more affordable alternatives for their golfers. I did get to hit the Thin Ply Technology shaft at their booth. The shaft felt fine, but the issue I had was the lack of comparison to other shafts to see how it performed. I got on Trackman and my swing was lousy as I was hitting balls with sneakers on, my feet and legs were sore from walking so much and I hate hitting into nets (kills my swing). My average club speed was 109 mph, but with a +5 to +6 degree upward attack angle. I was getting too much right pelvic tilt and secondary tilt, which is a common problem when I’m swinging poorly and it causes high attack angles, high dynamic lofts and thus, high spin rates. My average carry was about 270 yards, but the spin rates were were around 3,000 rpm’s. Again, I wasn’t swinging it well for numerous factors, but that’s a big goal for me in 2018…get the attack angle down a little to +2 to +3, decrease the dynamic loft and lower the spin rate to the 2,300 or less range. I figure that the current swing (again, I didn’t swing it well) was probably costing me about 3-6 mph of club speed and probably close to 10 mph of ball speed. 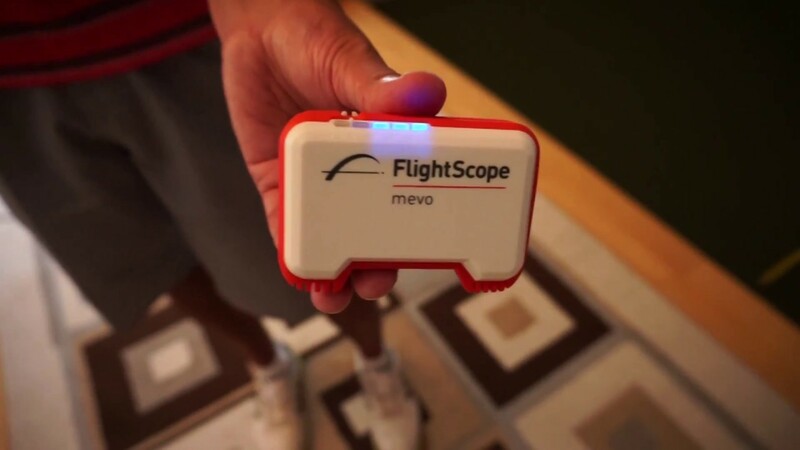 And that’s why I decided to go over to the FlightScope and purchase the FlightScope Mevo. Obviously, it does not have attack angle and dynamic loft numbers. But, I can use it to look at vertical launch, club speed and spin rate numbers and get a better understanding of my progress with the swing. I also believe that it’s a good training tool for club speed as it’s easy to get lazy with club speed if you don’t train with something that measure it. I also plan to do some club fitting with it. I know my 5-iron isn’t not properly gapped as it only goes about 4 yards further than my 6-iron. But, I can also do some tests with golf balls, drivers, and hopefully put myself and my friends into some better equipment fits. They had a deal at the show where you could get the Mevo for $450 instead of the typical retail price of $500. Before I made my way over to Fujikura I tried out the Halo Neuroscience (www.haloneuro.com) booth. This is one of those companies that I researched on the Exhibitor List on the PGA Show web site before I made my way over. A couple of years ago I was really high on Ikkos’ CopyMe Golf. And I still think it was a good concept that helped my game quite a bit. The issue with CopyMe Golf is that it is based on the visuals you see from golfers or whatever model you want to copy. And often times what you think you see on video isn’t exactly what is happening. For instance, you may see a golfer getting their lead wrist into flexion in the downswing (ala Jon Rahm) and think that all you need to do is actively get your lead wrist into flexion. But, in reality there are easier ways to do that instead of consciously trying to get the lead wrist into flexion. From what I’ve been told from the Halo Neuro people the head phones do not play any music or binaural beats (unless you want them to). They have pads that stimulate the motor cortex of the brain to help you more quickly develop whatever you’re working on. I tested it out and you could start to feel it tingling on your skull. And you can change the amount of sensation with their app. I don’t know if it works or not, but I do believe they have a 60 day guarantee. They retail for $750, but if I could get even better improvement than what I got from Ikkos, it certainly would be worth it. The other problem I had with Ikkos is that I switched over to an Android phone and while Ikkos has an app for Android, the thing never works. It appears that Ikkos is basically giving up on the golf concept and focusing more on using it for swimming training anyway. Lastly, I hit up Fujikura. Fujikura is usually in their own room and not out in the exhibition floor. It’s a no frills approach with nothing but a water cooler, some tables and chairs and Fujikura dealers can come in and have a one-on-one talk with people like Director of Tour Operations Pat McCoy, Vice President Alex Dee and President David Schnider. This room allows for Fujikura to communicate with their dealers more effectively. It’s a laid back setting, you don’t have to worry about all of the noise and people having to stand while talking to you, and all of the distractions that come with the Exhibit floor. It’s a time to deal with questions and concerns their dealers have. The great news is that there is a lot of great things on the horizon for Fujikura and they were explaining some things to me that we will go into when I take a trip out to Southern California and visit Fujikura this Spring. I hope to have the experience done in a vlog format so people can best understand what Fujikura is doing and also show the fitting process with their ENSO machine. One of my highlights…for me anyway…was getting the chance to talk in depth with Alex Dee as I’m a huge fan of his work and understanding of shaft technology and how to develop shafts. I am a firm believer that Fujikura is the greatest graphite shaft company in the world. Nobody has more of a variety of shafts with different properties that can fit and has the ability to have made great shafts. And many others that I unfortunately cannot remember at this time. It was a good time for all and again…the reason why it’s always worth it to go to the PGA Merchandise Show.